Vitiligo also known as Leucoderma is a skin condition wherein color is lost from the skin, hair and at times even the eyeballs of the patient. Discrete white patches with no surface changes are seen on the skin in various forms and shapes. Vitiligo is an autoimmune condition, wherein your body produces antibodies which act against the pigment producing cells called the melanocyte. (In other words your own body is attacking your pigment producing cells). The attack may be restricted to a certain area (Localised Vitiligo) or maybe more widespread (Generalised vitiligo) which results in white patches restricted to a certain area or being more widespread involving larger body parts. Further, vitiligo may also involve the lips, eyelids and / or genital mucosa. Vitiligo carries with it an immense social stigmatisation and a psychosocial impact to the patient. 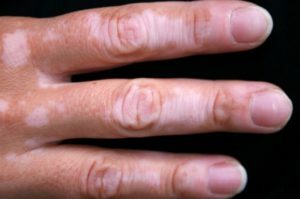 This condition is controllable and complete re-pigmentation can be achieved in a vast majority of cases, depending upon the type and stability of the disease. Treatment typically involves medical treatment which maybe topical creams and / or lotions, oral medication, light and laser treatments and finally for resistant cases surgical management. Early intervention and achieving stability of the condition is crucial and hence visiting a certified dermatologist, providing the right direction for treatment of the condition is important. Visit Dr. Kandhari’s Skin Clinic for the right diagnosis and a comprehensive Vitiligo treatment in Delhi.